Make elephant finger puppets that are animated with three of your fingers—two fingers for the legs and another finger for the head. 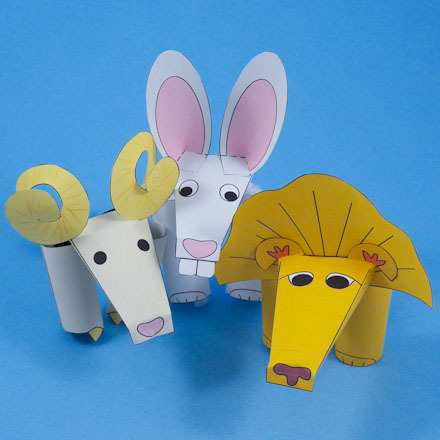 These puppets are easy to make—just cut, fold and glue. You can make up stories and put on plays with the elephant as the star! For triceratops, lion, rabbit and sheep puppets made in a similar way, checkout the Triceratops Finger Puppets and Three-Finger Puppets craft projects. Related craft: For more finger puppets, see the Paper Cone Finger Puppets and Toilet Paper Tube Puppets projects. Choose the puppet that you want to make. 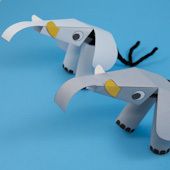 The colored pattern has elephant puppets in two shades of gray. Download the pattern and print it on white paper. If you printed the black & white pattern, color the puppets any way you like. 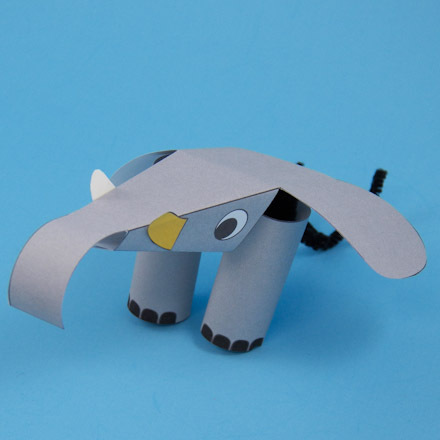 Elephants are usually gray, but elephant puppets can be any color. Tip: Color both sides of the elephant's tusks. Cut out each puppet part on the outside black line. Each elephant puppet has a head, two legs, and two tusks. Tip: You may find it easier to use tape. Wrap the leg around your finger and tape it while it is on your finger, but not too tight. Bend the head down at the top and fold the ears down. Glue a tusk to each side of the head near the end. Curl the trunk down. Tip: You can give the trunk more shape by curling them over a pencil with your fingers. Tip: Your elephant puppets can have four legs. Just make leg coverings for your thumb and little finger. Now you can have your elephants walk on four legs. Bring your elephant puppet to life by putting the head on your middle finger. Put one leg covering on your index finger, and put the other leg covering on your ring finger. Now make your puppet walk by moving your fingers. Think of what your elephant puppets will do. Where does your play take place? Write down what the puppets will say and figure out how they will move. Will more than two puppets be on stage at once? Do you need a friend to help? Rehearse your play a few times, and then perform it for family and friends. That's it! You are ready some elephant make-believe! Tip: The colored pattern has elephant puppets in two shades of gray—make one or both. 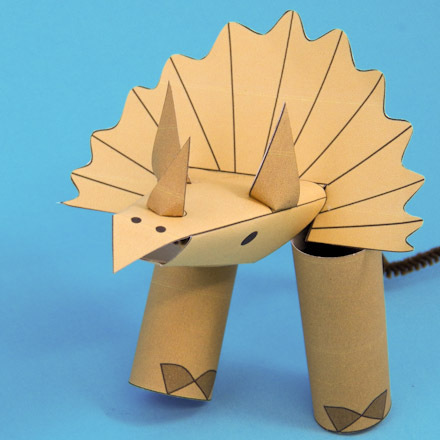 Tip: For additional finger puppets made in a similar way, checkout the Three-Finger Puppets and Triceratops Finger Puppets craft projects. 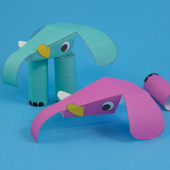 Tip: You can make the elephant finger puppets any way you like—fanciful colors or glued-on googly eyes. For these colorful puppets, the puppet pattern's black & white PDF file was opened in Inkscape (a free drawing program) and the colors were added.